Joseph’s birth was a very traumatic experience for both he and his mother, Danie. Born two weeks late, Danie actually died while giving birth, and was clinically dead for seven minutes. Doctors were unable to get Joseph out on time, and when he was finally delivered, his umbilical cord was wrapped around his neck. Joseph was clinically dead, and doctors had to resuscitate him. Joseph was immediately moved to the NICU, and during his stay there, it was suggested that he be taken off life support, as doctors saw little hope of him surviving without it. However, this option was unthinkable to Danie, who was determined to give her little boy a fighting chance. Joseph survived, but immediately started having seizures, which continue to this day. Joseph was also diagnosed with cerebral palsy, which results in him having very little control over his limbs. 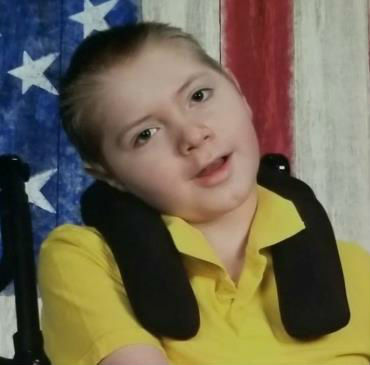 Joseph has also had numerous complications with his gastrointestinal system. He had a feeding tube installed at just three-weeks-old, and endured stomach surgery when he was three-and-a-half. He continues to take daily medication to help with these issues, as well as to help decrease his seizure activity. Joseph has physical and occupational therapy sessions every week. He is mostly in a wheelchair but does love to practice walking by using a gait trainer. Joseph has even learned how to communicate using a piece of technology called an “Eye Gaze System.” Although the odds have been stacked against him since the moment he was born, Joseph beams with light and is a shining example of never giving up, no matter the circumstances. Joseph will be adopted as a Sparrow to Mazama High School, in Klamath Falls. Students at Mazama High will work hard to raise money for Joseph through sponsored community service and fundraising projects.